Spend the night in the Arizona desert and one of the first sounds you’ll hear in the morning is the distinctive call of the quail. This ground bird is found in many parts of the United States, including the southwest. Quails are small, plump birds with brown to bluish-gray feathers. A plume on the tops of their heads bob as they walk. Quails are small, plump birds with brown to bluish-gray feathers. A plume on the tops of their heads bob as they walk. In spring and summer, you’ll see mother quails walking through the desert or grasslands, their babies trailing behind them. Quails are sometimes hunted for their meat. In some places, they have been hunted almost to extinction. Quails can only fly a short distance. Did you know this all about quail? 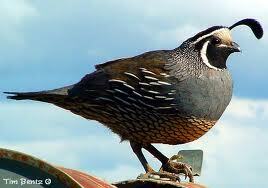 Quails eat seeds, grain and insects. Quails can lay 10 to 20 eggs at one time. 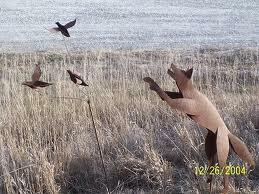 Cats, skunks, fox, snakes, owls and dogs hunt quail. Quails usually live alone, but they form flocks in the fall. Quails can only fly a short distance. Quails build grassy nests on the ground. A video about the quail species. 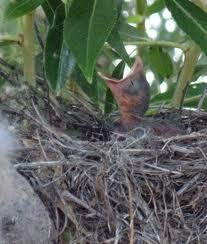 Question: Do quails build nests? 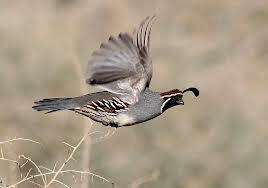 Answer: Quails build grassy nests on the ground. Question: Do mothers raise their babies alone? Answer: Sometimes. At other times, groups of quails take care of the babies together. Enjoyed the Easy Science for Kids Website all about Quail info? Take the FREE & fun Quail quiz and download FREE Quail worksheet for kids. For lengthy info click here. Declan, Tobin. " Quail Fun Facts for Kids ." Easy Science for Kids, Apr 2019. Web. 18 Apr 2019. 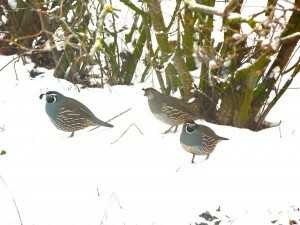 < https://easyscienceforkids.com/all-about-quail/ >.